Here is a thought for a Christmas Gift. Last night I volunteered at an annual college-community holiday event where the college opens the campus up to the community. The experience is as magical as visiting Disney Land in December. There are activities for all ages; music, food, and fun. An incredible amount of fun. Being that the college is an institution of higher-learning, there are many STEM activities, brain-sparking activities, make me think we when I just want to have fun stuff. Last night I was assigned to the paint station. I was dressed rather nice and being assigned to the paint station caused concerns. Two things immediately settled my uneasiness. One, the paint washes out of clothes. Two, I saw what the children were using to paint with. The children were having so much fun and I could hardly wait to write their names on their papers (my duty for the night) so that they could get over to the paint-pit and create their masterpieces. What they used as their paintbrush was the Sphero SPRK. I recorded video footage. I left the faces of the children out of the video, but there were plenty of smiles. The ages of the children ranged from 4-years of age up to as old as twelve. Th activity was very engaging and there was a finished product for the children to take home. I imagined playing with the Sphero around the house, walking it outside like a dog, and giving it different faces- one of the young ladies running the station took the cover off the Sphero and replaced it with another one. You may ask what makes the Sphero different from the average remote control car? Well, for starters, the Sphero SPRK comes with a curriculum. You can browse the official Sphero Education website if you want to have a look at it. 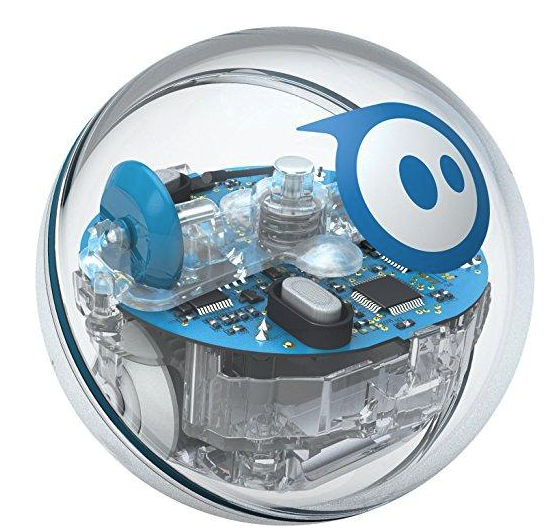 The Sphero is programmable as well as drivable. It is an innovative way to introduce coding to young minds. I tried it and found it engaging and fun. I liked claiming that I was programming a robot. The best thing is that teachers that use Sphero in their classrooms have a ready-made curriculum provided by Sphero Edu. A class set can run as much as $2000, but you can get a single one for $90. What is the educational world saying about Sphero? The Sphero SPRK Edition and the awesome SPRK app are a great way to inspire a love for STEM principles, coding, and robotics while teaching children the power of conditions in programing, cause and effect – all while having fun. Kids and adults (trust me you’ll love this things too) can use the SPRK app to give their Sphero robot orders using Sphero’s own C-based language, OVAL (Jenn, 2015).. Read Jenn’s blog and judge for yourself. The Sphero is not new to the world, but it is still a secret to many. Last night was fun. I always enjoy myself at the Christmas celebration at the campus. I close with one last thought about the Sphero SPRK. As advanced as the little robot is, it is still made in the shape of a ball. I had an urge to throw it. Other programmable robots used at the festival were the Dash and Dot and several programmable Lego units. A picture of the Dash is below. My blog may contain links to other websites. I am not responsible for the privacy policies of those other websites. Next story GoDaddy bloggers must read this blog. My blogging experience with GoDaddy. Previous story In the Stock Market Jungle? How Do You Survive?